For the smoothest game playing experience we always recommend that you keep your PC’s operating system up to date. As well as using Windows Update to install the latest operating system upgrades, it is important to find the latest graphics card drivers wherever possible. Performance gains might also be made by updating other drivers on your system. If you are unfamiliar with updating Windows, see this article. 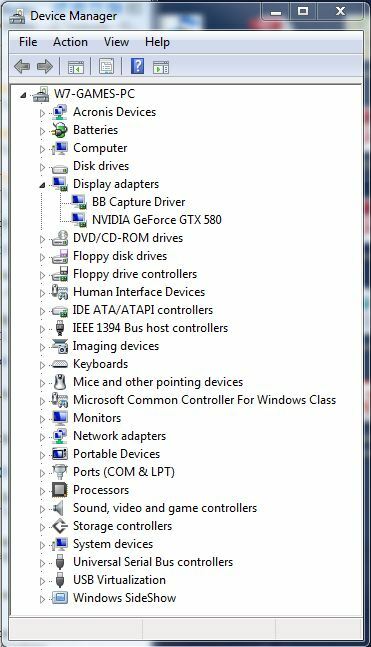 Although some graphics card drivers can be downloaded from Windows Update, often there are newer or improved versions available directly from the manufacturers website. If you have problems running any game, old or modern, checking for a graphics card driver update is highly recommended. To determine what graphical hardware your PC has, follow these easy steps. 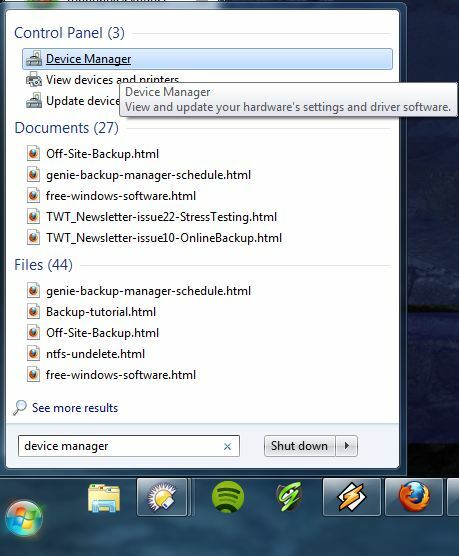 1) Open your Start Menu and search for “device manager”. Click on the icon that appears at the top. Windows 8 users can simply search for “Device Manager” on the Start screen. 3) The graphics card make and model will be shown. In the example, the card is an NVIDIA GeForce GTX 580. Most systems will only have one display adaptor listed, but some systems may have two or more. Certain screen capture software installs its own pseudo display adaptor. In the example this is what the “BB Capture Driver” represents, this isn’t used by games. Very high end machines may have two or more graphics cards, in which case you should update the drivers for all of them if an update is available. For NVIDIA cards/graphics processing units visit this site. For ATI or AMD cards/graphics processing units visit this site. For Intel cards/graphics processing units visit this site. For other models of card, please refer to the documentation that came with your PC and/or your graphics hardware.